The highlight of Tommy’s professional career came in 1893 when he appeared at the Royal Aquarium in London. When it opened in 1876 the Aquarium was a lavish palace of intellectual entertainment offering classical music, art exhibitions, concerts and plays. But from the 1880s, the programme moved towards more profitable music hall variety and sensational acts which were extremely popular with Victorian audiences. 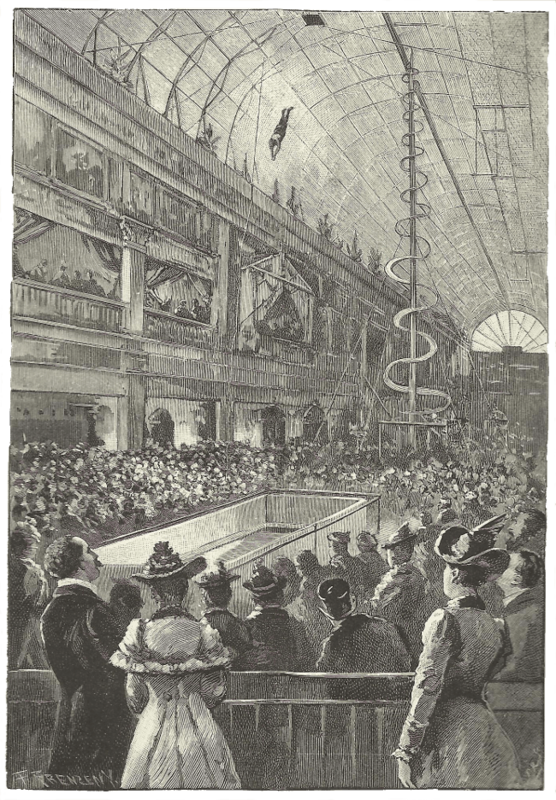 HIGH DIVE: An illustration from the weekly newspaper The Black and White showing Tommy Burns performing at the Royal Aquarium in 1893. The Royal Aquarium has got hold of a new novelty to attract the town. Tommy Burns, the well-known swimming expert has undertaken to dive from the summit of the Aquarium dome – a tremendous height – into a tank of water below only six feet in depth. Not since Baldwin made his first parachute descent has there been anything in the dangerous exhibition line that gave the same amount of preliminary thrill. The newspaper described how Tommy appeared on stage “looking a very pretty fellow in his blue tights and flesh-coloured jersey. On his breast he wore a garment consisting principally of the gold and silver medals he has won in swimming and diving contests’. …did not appear in the least degree nervous as he put his foot in the loop of a rope, and was hauled up to a platform some 83 feet above the floor of the Aquarium. I beg to ask the Secretary of State for the Home Department whether his attention has been called to the exhibitions now going on of jumping and diving into water from a great height, and to the extreme danger of the performance; and whether he can do anything to stop such exhibitions? My attention has been called to the exhibitions referred to in the question of the hon. Member; but I have no power to stop exhibitions or performances which, though they may be dangerous to the performers, are not necessarily dangerous to the spectators. On this, as on similar previous occasions, warnings have been given through the police to the persons responsible for the exhibition that they should take all proper precautions, and I am afraid I can do nothing more.to the Home Secretary of the day, H. H. Asquith. Although there were 13 large tanks in the building when it opend, it was not initially used as an aquarium due to problems with the water supply. Curiously, a dead whale was exhibited in 1877 and some years later, a live whale went on show. In 1883, the Aquarium was presented with the carcass of a shark killed by Tommy after it attacked him in the sea at New Brighton.